To feel not good enough. And it’s hard at the end of the day. Memory seeps from my veins. Quite as often as I could have. I should have said and done. classified as EVE (Earth Virtual Equivalent). Although Bill Kincaid spent over 35 years practicing law in Texas, he started out as a writer and journalist whose articles and columns received several state-wide honors. Now that Bill is slowing down his legal practice, he finally has time to return to his writing roots, publishing two historical fiction books and one fractured fairy tale. 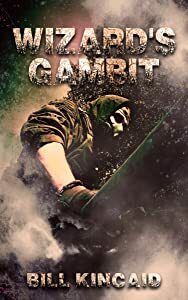 Wizard’s Gambit is his first science fiction / fantasy novel. Bill and his wife of over forty years have three adult children. Q. What books have influenced your life the most? I’ve been most influenced by The Bible and The Science of God. However, my favorite fiction includes White Fang, Hound of the Baskervilles, several of the Thoene books, and The Hunger Games, Harry Potter, Jack Reacher, and Divergent series. Q. Which actor/actress would you like to see playing the lead character from this book? Probably someone like Tom Cruise, Matt Damon, or a young version of either Harrison Ford or Mel Gibson. The cover depicts part of a battle between Wizard Malmortiken’s forces and those of King Kylandar. The material can be transcended.